School is obviously a great place for imparting knowledge to children, but there are some things that schools simply cannot teach. There are skills and abilities which need to be developed in the home to ensure our children grow into balanced and well-rounded individuals. Helping your child’s education by utilising home teaching supplies is important, but the development of real-world connections and social skills is a far more crucial element of growth within the home. University is, for many people, the first time that they have needed to fend for themselves. The following anecdote of an experience during my first week of university will demonstrate why development of the social skills listed below is of vital importance. Having responded to the question ‘How do I cook a pizza?’ with the answer ‘Put it in the oven.’ I was somewhat surprised to witness a girl of 22 put a pizza in the oven and turn it on with polystyrene base, polyethylene wrapper and cardboard packaging intact! 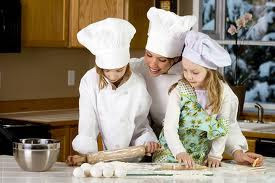 Aside from how sweet it is to see children cooking together; the process of getting children to follow a recipe teaches them numerous things. Firstly, it offers a great chance for social interaction in a team-working environment. Secondly, it provides real world maths practice. It will never be as good as a maths worksheet at drilling in understanding, but it will provide a reason for them to learn. Finally, it offers a fantastic opportunity to explain hygiene and provide your children with the ability to feed themselves. Building something provides similarly useful skills. It will offer your child the ability to plan, think analytically and experiment creatively. Building something can relate to building a Lego model to instructions, building with a specific goal but no guidance, and building with no boundaries. All of these processes will help to hone skills and provide your child with real-world skills for coping with other people and challenges. Whether this involves painting a room with your child or setting them loose with art supplies, this process will allow them to experiment with their creativity. In addition to this it will help children to improve their coordination and their dexterity. Using ‘Paint by Numbers’ guidance you can also help them to improve their skills and begin to understand the need for rules and guidelines. · Plan a holiday budget. Setting aside a ‘fun activity’ budget for a holiday will almost certainly be what you would do anyway, but allowing your child to participate will provide them with huge value and skills. Provide them a sum of money (you don’t actually have to give it to them, of course) and a list of costs for possible activities. Working out what to do and how much it will cost (in terms of time and money) will allow your child to understand how to budget effectively and provide them with a broader understanding. · Plan a shopping budget. Doing a fortnightly shop may be a bit much for a child but you can plan a budget for a single meal and get your child to determine what it is that you buy. Planning a budget is a good way to teach them about what food costs and also offers a great maths-learning opportunity. Challenge your child to total the goods as you pick them up to hone those skills. Very nice post for an actual problem. this is great. I ilke you style of writing!) Thank you for writing on this theme. I completely agree with this post about lessons which should be given at school. I enjoy reading this post check here for more information.